Walking Tour Booklets are available at the Chamber of Commerce and the Public Library. This fine house was built in the mid 1890's by then Reedsburg Postmaster August Siefert. The house exhibits a number of different design influences including the Queen Anne but most predominately the Shingle style, in which the mass of the house is emphasized by a tight wrap of shingles. Built shortly after the turn of the century, this house was owned by City Attorney, Charles H. Stone. Later, Stone became the Sauk County Assessor and President of the State Bank. The house is designed in the Queen Anne Free Classic style and retains a high degree of architectural integrity. Believed to be the oldest building fronting City Park, this house was built around 1870 in the Italian style and was the longtime home of Savillian F. Smith. Smith was a hardware merchant and later a partner in a cigar manufacturing firm. In 1873 the house was moved back eight feet and a full width porch was added. An 1885 description of the house reports it as being cream colored with a bright red porch. Built about 1910, this was the home of Louis Dangel, president of the Stolte, Dangel and Foss Co. This general merchandising store formed in 1893 and later became known as the Big Store in 1908. The house is an American Foursquare with Colonial Revival detailing. Particularly interesting are the two-story pilasters at the corners of the house, best seen on the north side. The dominant feature of this home is the use of the gambrel roof. This is further accented by gable returns which sprout the unique horse-shoe shaped bargeboard. The house is a mixture of Dutch Colonial elements and late Queen Anne features. Built about 1906 it was home to John T. Kelley, a Reedsburg blacksmith. Known as "The Westly" design, this house was constructed around 1913 as a mail order house from Sears, Roebuck and Co. The mail order cost was about $1,000 at the time. Built in the bungalow form, the house tries to look like a one story home but is really a full two stories with attic. The house has been in the Harder family for more than 50 years. This house is a blend of late Queen Anne form with Colonial Revival detailing. The extensive use of windows on the house is noteworthy. The heavy cornices above the windows on the front porch and the two-story semi-circular bay on the north side of the house add to the character of the house. A Palladian window is also used on the north side as well as two arched windows in the attic story gables. This is a late Queen Anne style house. Interesting features are the wraparound porch, leaded glass window, modillionlike brackets along the cornice and bargeboard in the gable. The original brewery opened in 1870 on this site when Sauk County was one of the chief hop producing areas in the state. In 1898, Albert Fuhrman purchased the brewery and made it a huge commercial success. The old plant burned in 1903, and was rebuilt in 1905. The plant had a capacity of 8,000 barrels and ran successfully until the prohibition era. Under new ownership after prohibition, the brewery ran until 1950. The brewery retains a high degree of architectural integrity. Al through four stories today, the corner section once rose another story and a half as a tower. Originally, the first story contained the engine room and boiler room, pressure and racking rooms, and washrooms. Doors between sections were built like refrigerator doors so that correct temperatures could be maintained. The brewing kettle extended to the second floor, which also contained fermenting vats, mash machinery, and hop storage space. The third story contained a 150 barrel water tank and above this level, malt was stored. A one story wash house is adjacent on the north. Another one-story section west of the brew house was built as a general storage area and originally was separate from the main building. North of the brew house was an office and pitch house of one story. Just north of this is a one story brick building that housed bottling works. The building stands today as an excellent example of adaptive re-use as an apartment building. Built about 1908 this pleasant house exhibits features from the late Queen Anna style. The half-round window with "y" tracery on the second floor is echoed by the semi-circular porch. The fish scale shingles run in two bands on the second story and are accented with contrasting color. Sporting one of the best tower roofs in the city, this house was built between 1904 and 1912 by Henry and William Hahn . The Hahn Brothers came to Reedsburg about 1879 and built many structures in the city. The house has essentially a cross gabled plan with the tower tucked in one corner. Also of note is the unusual window tracery in the second floor windows on the front of the house. Designed by Madison architects Flad and Moulton, this structure was built in 1933 as the Reedsburg Municipal Hospital. The design uses the Georgian Revival style with flat pilasters flanking the entrance pavilion. A small balcony protrudes above the front door. This was known in the 1880's as the "house on the hill" and dates back to one of the earliest founding families of Reedsburg. Austin Seeley built this house c.1867-1874. In 1886 the Seymour family purchased this property for $1,250. They lived here for 75 years. S.J. Seymour was a member of the State Legislature in 1876 and 1877. The house is Italianate style with ell shape but has no tower. Distinctive features are the decorative brackets with pendants and the two-story porch with balustrade. Other details are the 6 over 6 windows, shutters and low roof pitch. This residence is an excellent example of a late 19th century Vernacular gabled ell house. Special features are the bay windows, added in 1882, with its bracketing and panels, and an entry door that has a pair of semi-circular arched window panes with etched glass. Most other windows are 2 over 2 that have cornice heads and shutters. Austin and Mary Seeley, early settlers, built this house in 1877. He was a carpenter and gunsmith, and was one of three earliest known gun makers in Wisconsin. This is a Vernacular style house with details suggesting Colonial Revival. The center gable has heavy shingle returns, sometimes referred to as a broken pediment. It has an open full length front porch. The house plan is rectangular. Constructed c. 1924, this house was built in the Colonial Revival style. Special features are the one story portico with leaded glass, fanlight and sidelights on the entry door, and three dormers with shingle returns. Windows are symmetrically placed and multi-paned. Another feature is the large end gable with shingled returns. The original owner was Edmund Huebing. This residence, built c. 1890-1904, is the only local example of a Queen Anne style with this type of detailing. The fine wood trim over the windows and gables is enhanced by its contrast with the red brick. The second story turret was added between 1904-1912. Another feature is the clipped or angled corner windows. George W. Kelley is reportedly the original owner of this house. This is a Queen Anne Free Classic style house. It features a hipped roof with cross gables, finial on the pyramidal roof and two-story corner pilasters. Also noteworthy is the fish scroll ornamentation in the gables. Constructed c. 1876, this is the only house in Reedsburg with Vernacular Italianate styling. The front is highlighted by an open porch that spans the entire facade. Special features are heavy sawn ornamental woodwork under the porch eaves and four narrow square columns with sawn wood brackets above and pyramidal shaped bases below. Other features are : arched 2 over 2 windows with brick hood molds and shutters. Also noteworthy is the double front door. Since 1891, this house has been in the Meyer family. Constructed in 1901 by Lavina Green, who had suffered the loss of her husband and daughter, this house is now the Lavina Inn Bed and Breakfast. Special features of this Queen Anne house are the turret, wraparound porch and the two story bay. It has a hip and pedimented gable roof, palladian window and second story porch. St. Peter's Lutheran Church was constructed in 1908. It's twin towers, pointed arches and vaulting suggest Gothic Revival styling. One steeple is 120 feet tall and the second steeple is 136 feet tall with a clock measuring 8 feet across and a 3000 pound bell which originally cost $600.00. Other nice features are the colored glass windows and window tracery. From the second story up, this 1877 house is a wonderful local example of a 19th century Italian Villa style residence. Special features are the tower centered on the front of the house, paired brackets under the eaves, and the second story windows that have entablature window heads. It has a low pitched hip roof. S.V. Shipman of Chicago designed this house as well as the business blocks of 233 and 237 Main Street. Henry C. Hunt was the original owner. He was a prominent businessmen, politician and postmaster of Reedsburg. Built c. 1916, this house is of the Craftsman Prairie School style. A key feature is the barge board of angular design and similar porch rail. Other nice features are the exposed rafters, stucco exterior and sidelights around the door, all of which characterize Craftsman detailing. The original owner was Martin Hickey, prominent business person who was associated with the Citizens State Bank. This Queen Anne, built c. 1892 has several interesting features: the occular window, angular leaded glass window, tall brick chimney with corbeled cap and the two story bay windows. A 1912 photo shows an open front porch and a finial atop the conical roof. Previous owners were O.R. Ryan, jeweler and traveling salesman and D.G. Schweke of the Big Store. This is the only house in Reedsburg built in the French Second Empire style. The hallmark of this style is the mansard roof which hides the third story. Other features of this outstanding house are the small circular windows under horseshoe shaped arched dormers. The open front porch has paired brackets, paired columns with capitals on bases and a wood balustrade. The corner columns are tripled. Large 4 by 4 windows have horseshoe shaped arched heads. There are paired brackets under the eaves. William Dierks built the house c.1873. He was a carpenter and builder and also a partner of Edward M.Hackett. The business blocks at 251 and 297 Main Street were also reportedly designed by Dierks. Abner L. Harris bought this house in 1874 for $4,000. He served as postmaster and three terms as mayor. Harris was a prominent merchant and early financial and active promoter of Reedsburg. This is a Vernacular Frame Ell style house, but the semi-circular arched head windows suggest Italianate influence. There is a large bay window in the front. The house is currently of stucco material. Interesting features of this brick bungalow house are the two eyebrow dormers and an ogee-shaped banister by the front porch steps. Four porch columns taper from brick bases. The house has a jerkin or clipped head roof with rounded eaves. The E.M. Hackett house is an outstanding local example of High Victorian Gothic design. It is a characterized by its steeply pitched roofline, tower and finials. Other distinctive features are the paired windows with arched heads capped by triangular woodwork. Bargeboards with a leaf-like pattern ornament the gables, and the bay windows on the north and west sides have brackets and sawn woodwork with a quatrefoil pattern below the cornice. South of the house is a carriage house that was built in the early twentieth century. The house was built in 1877-1878 by Edward Hackett, a local lumber company owner, builder and prominent architect. This is a cottage style Gothic Revival house. Special features are the arched woodwork trim on the full front porch and the dormers with pendants. It has a steep roof pitch. Built in 1905, this red brick building replaced one of frame construction. The north entry features a Classical Revival portico with heavy fluted columns that have an entablature stretching above. The Chicago and Northwestern railroad line reached Reedsburg in 1872. Passenger service was a wonderful convenience for many until 1953. After that the building was used for storage only and fell into a state of disrepair. Restored and currently used as the Chamber of Commerce office, it is an excellent example of adaptive re-use. The 400 Trail was named for the Chicago and Northwestern train that traveled from Chicago through Reedsburg to Minneapolis (approximately 400 miles) in 400 minutes. The historical episode when local citizens rallied at this station to protest the removal of the Winnebago Indians and prevented their deportation can be seen in the video "Thunder in the Dells". Built in 1899, this was the home of William Stolte, Jr. who was a prominent civic leader and businessman in Reedsburg. He was one of the partners in Stolte, Dangel and Foss Co. which became the Big Store. For many years he was an active promoter of the Old Settlers Association. This Queen Anne style features a wraparound porch, tower capped with a conical roof, muli-gabled roof with dormers and scroll-like modillions around the cornice. Note the gable ornamentation and bay windows. This remarkable house displays a distinctive combination of Victorian Gothic and Queen Anne styling. Featuring two stories with a hip and gable roof, bay window and colored glass windows, it is one of the few houses in Reedsburg with detailing of this kind. Noteworthy is the heavy wood ornamentation on the two front porches. A frame smokehouse and hitching post with "Stolte" inscribed on it remains in the backyard. When the house was built in the 1880's this was a small farms of about 30 acres. The original owner, William Stolte, Sr. built the Hotel Stolte, currently the Cornerstone. He was a prominent business person and ardent supporter of St. John's Lutheran Church. An unusual feature of this late Queen Anne style house is the diagonal corner bay window. There is a second bay on the north side. Noteworthy are the fan details in the attic gable, open front porch and a hip roof with cross gables. The house was built in 1892 by Reedsburg Building and Lumber Co. It was reportedly Frank Darrenougee's first residence. He was a barber and jeweler and later vice president of Home Lumber and Construction Co. Built c. 1890, this Queen Anne Spindlework style house has ball and rod detail work at the corners and porch. The corner entrance recesses into the main block of the house. Other features are a hipped roof with cross gables, and leaded upper sash on the front windows. Built in 1908, this was the home of Albert Sorge. He was an officer and then vice-president of the Central Wisconsin Creamery, forerunner of Dolly Madison. He was also an assemblyman. Interesting features of the house are the three-story tower with bell cast pyramidal roof and the pedimented gable with triangular window head. The Riggert house lacks the characteristic tower of other Queen Anne houses but is distinguished by a more delicate style of ornamental woodwork. The second story porch, bays, wrap around porch with hip roof and gabled entry complement the overall well proportioned lines of this house. There is a nearby carriage house southeast of the home. Designed by local architect and carpenter, Willard W. Rork, the house was constructed in 1892. William Riggert, original owner, was associated with several local banks, village president and then a member of the first Reedsburg city council. Built in 1892, this Queen Anne style house was owned by Judge Giles Stevens. At the outbreak of the Civil War in 1861, he organized Company B, 12th Regiment, Wisconsin Volunteers. As captain, he served for three years. In 1878 Stevens built the business block of 249 Main Street. This house features a variety of surface textures including "stickwork" ornamentation applied to the clapboard siding. Note also the bracketed front window with leaded glass. An unusual feature of this house is a small eyebrow window/dormer on the south side. Other nice features are the great variety of shingle and stickwork in the gables. It also has a hipped roof with cross gables. An original picture shows a full wraparound porch. Built in 1889, this is a Queen Anne Spindlework style house. Ralph P. Perry was the original owner. He was associated with, then became president of the Reedsburg Bank. Intersting features of this Stick style house are the two-story bay, fish scale detailing in the gables, an Arts and Crafts/Prairie style open front porch, window caps and hand-sawn detailing along the cornice. $172, 465. This two story red brick building with gabled roof was designed by Frank Moulton of Flad and Moulton, Madison. He was designed the former hospital on North Park Street. Built in 1911 with the support of $10,000 from the Andrew Carnegie Foundation, this red brick building with wide eaves and low pitched roof shows the influence of Prairie-Craftsman styling. It served as Reedsburg's library until January of 1998. The 200 block is an outstanding example of a late 19th and early 20th century commercial block in a small city. Some of the buildings are Italianate, others are Commercial Vernacular. The decorative cornice tops are especially interesting and the wide main street allows a sweeping view of the business district. The Stolte Hotel, now known as the Cornerstone, has been beautifully restored. Particularly interesting is the two and one half-story tower on the northeast corner. The mansard roof is broken by dormers and there are oriel windows on the second and third stories. A one-story portico entry has limestone columns and a flat roof. Built in 1896 by the Stolte family, it is the most ornate and prominent Queen Anne style commercial building in Reedsburg. Built in 1910 for $10,000, the Times Building had been the home of the Reedsburg Times Press. It is included in the downtown 200 Block Historic District. The exterior is Menomonie brick with Bedford stone trim. Other features are windows that have arched heads with stone keystones and the cornice with corbel brickwork. 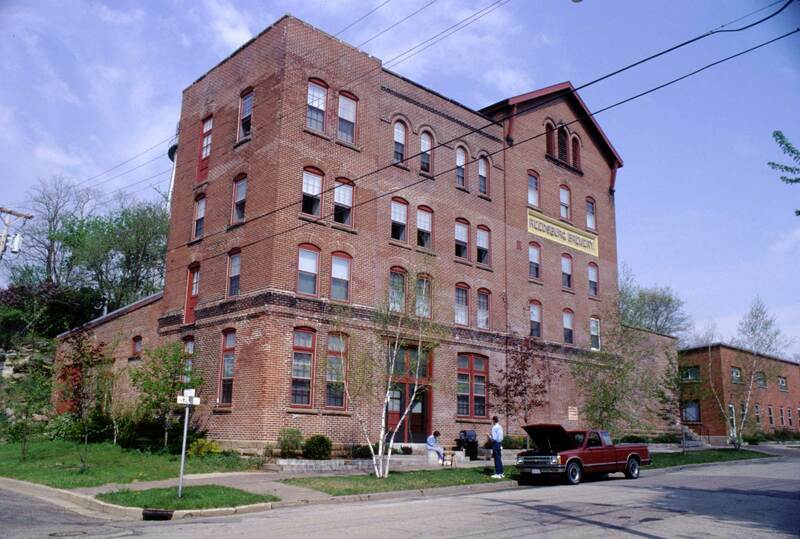 Constructed in 1886 for $10,000, this Second Empire business building was designed by Edward M. Hackett. The former City Hotel is a two story red brick structure with a mansard roof. Brick detailing on the facade and the second story small porch with an ornamental metal balustrade are noteworthy. All that remains of an important early industry in Reedsburg is this 2/2 story red brick building. For over 80 years the woolen mill made items ranging from army blankets to fancy and novelty wools for Montgomery Ward and Sears. With 200 employees, the wooden mill was the largest business in the city. In April, 1968 a fire destroyed the mill and in 1973 the dam was torn out. This livery, constructed in 1911 by William Corwith, is one of only a few remaining in Wisconsin. It provided a basic form of transport before the automobile arrived on the streets of Reedsburg. Features include: a large center door for the horses and carriage to drive through and a monitor roof with a parapet roof line facing Vine Street. An 1912 photo shows this Queen Anne style house with a full front porch but the current shortened porch does not detract from its appearance. The Albert Meyer family was owner for many years. Interesting details are the oriel window, corner window, vertical and diamond pane windows, pedimented gables and gable roof dormer. An 1898 Sanbourn map shows this building as a warehouse for the storage of produce and seed. Stolte, Dangle and Foss were owners from 1918 to 1924. It is a rare survivor from Reedsburg's warehouse row.